Team WeddingSutra collaborated with Reliance Jewels, to create incredibly trendy looks for this bridal season. If you want a bridal look that makes jaws drop, picking the perfect ornaments is key. 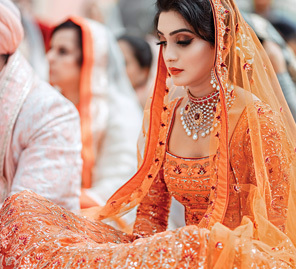 Your wedding lehenga will be a head turner so you want to make sure your jewellery works perfectly in synch as attention-holder, statement-maker, and sigh-inducer! Wondering where you should head to find pieces that will check all those requirements? The answer you’re looking for is - Reliance Jewels. One of India’s leading fine jewellery brands, Reliance Jewels hosts an extensive range of ornaments that span aesthetics from traditional gold to contemporary diamond sets. Whether it is kundan, polki, filigree or temple jewellery, the brand showcases legendary design and craftsmanship from various parts of India and includes more moderns designs encrusted with precious stones. In WeddingSutra’s latest edition of Style Spotting, we collaborated with Reliance Jewels to create for bride-to-be Manasvi Bachhav looks that she could take back to her wedding celebrations. While exquisite ensembles designed by Nivedita Saboo had her looking every bit the bride ready to make a grand appearance at her wedding functions, makeup by Neha Shah enhanced the appeal of it all by helping her look like the prettiest version of herself. Keeping in line with the mood of the shoot, Var Vadhu Weddings put together a setup that exuded a festive yet romantic vibe at The Gateway Hotel Ambad Nashik. Manasvi’s looks and the details that surrounded the day were captured skilfully by Knotty Affair By Namit & Vipul in wonderful frames. Any Indian bride’s trousseau is only complete when it includes baubles that are a nod to the country’s legacy of fine jewellery. Inspired by quintessential Indian aesthetics, this necklace from Reliance Jewels features intricate relief work, a smooth enamel glaze and uncut diamonds. The necklace set is complete with a pair of matching earrings that add to it charm. 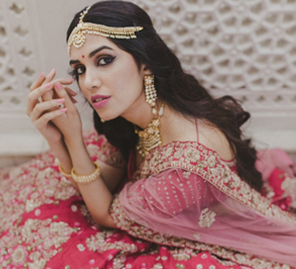 The bridal lehenga in blush by Nivedita Saboo went perfectly with the jewellery. The exquisite golden hand-embroidered detailing against the muted color of the ensemble made it an ideal pick for a night of dancing. To complete the look Manasvi put on two pairs of handcrafted kadas and was ready to bring on her best moves. When you have to turn up the glamor, Reliance Jewels is your secret weapon. This choker by the brand weaves a diamond-embellished net around your neck before it stretches out to reveal an exquisite design complete with floral motifs and brilliant emeralds. This piece is sure to rouse a sense of awe even amongst the generations yet to come. Manasvi matched this gorgeous necklace with an elegant yet playful gown by Nivedita Saboo. The outfit balanced its shimmering bodice and a plunging neckline with a ruffled ombre skirt. 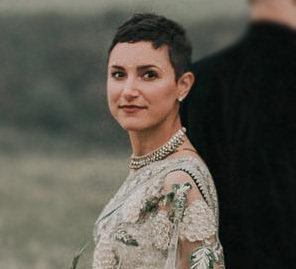 The beauty of the look was elevated by adding a meticulously crafted diamond and emerald bracelet, ring, and, earrings. Explore & Shop at the nearest Reliance Jewels Showroom. Click here to reach the store.